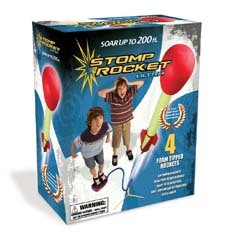 Stomp on the launch pad and the blast of air can propel the Ultra Stomp Rocket more than 200´ in the air. The kit contains four rockets with the OG-1 Nosecone. 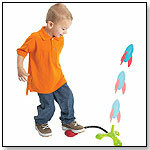 The Stomp Rocket by D&L is consistently named as a great seller by specialty toy store owners across the country. 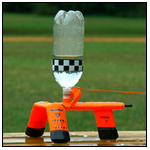 The stomp rocket support took just a few minutes to assemble. My 11-year-old stepdaughter was thrilled to see how far her first rocket went. She and her Dad (and the dog) devised a few games of competition and fetch that kept them occupied for some time.